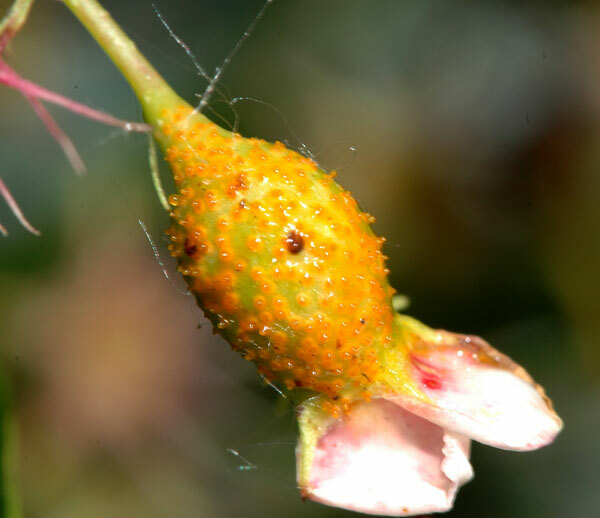 Cedar-apple rust and three related rust fungi need plants from two plant families to complete their life cycle; Cupressaceae family (eastern red cedar and other junipers) and Rosaceae (apple, hawthorn, serviceberry). Bright orange to red leaf spots occur on trees and shrubs in the Rosaceae family (apple, hawthorn, serviceberry, etc.). Hardy woody galls, witches brooms and swollen stems covered in gummy orange fungal growth in spring occur on juniper and eastern red cedar. 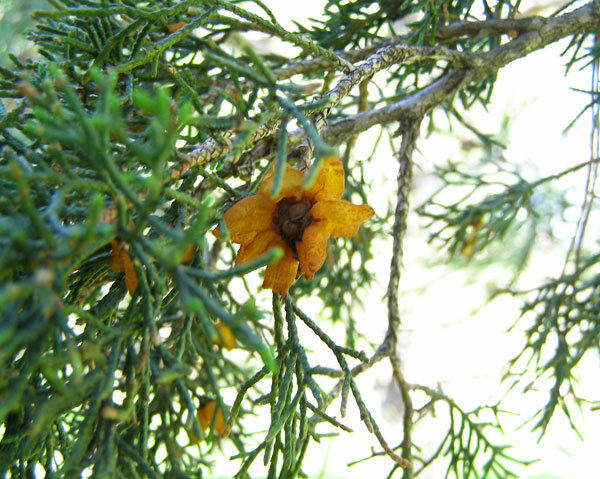 Cedar-apple rust and related rust fungi rarely cause serious damage to their hosts and do not require management. Some disease resistant varieties are available. These diseases require plants from two different families in order to complete their life cycle; one plant from the Cupressaceae family (red cedar, juniper) and the other from the Rosaceae family (crabapple, hawthorn, serviceberry). Symptoms are very different on each type of plant. Disease is most common on apple and crabapple. It occurs occasionally on hawthorn. Leaf spots are first yellow then turn bright orange-red, often with a bright red border. Small, raised, black dots form in the center of leaf spots on the upper leaf surface when the leaf spots mature. Very short (less than 1/10th inch), finger-like fungal tubes stick out from the lower surface of the leaf, directly below leaf spots. The fungal tubes appear fringed when they open at the tip to release yellow to orange, powdery spores. Rarely, green to brown irregular spots with black dots form on the fruit surface. Fruit spots do not extend deep into the fruit. Disease is most common on hawthorn, apple and crabapple. It occurs occasionally on serviceberry, quince and pear. Leaf spots are yellow to orange. Raised, black dots form in the center of the spots on the upper leaf surface as they mature. White, finger-like fungal tubes (up to 1/8th inch long) stick out from the underside of leaf spots. When infection is severe on hawthorn, leaves turn completely yellow and fall prematurely. Infection of green stems occurs occasionally and can result in thick, deformed growth of stems. This can cause shoot death when severe. Rarely found are orange to rust colored, spore-filled blisters on the fruit surface. Disease occurs in over 480 species of Rosaceae family including serviceberry, chokeberry, hawthorn, apple, crabapple, cotoneaster, pear and mountain ash. White, finger-like fungal tubes develop all over fruit and stick out up to 1/8 inch.Tubes rip open at the tip to release powdery, bright orange spores. Leaves are often unaffected. A few yellow spots may be found on leaves. Infected areas of stems bulge to become elongated and distorted. 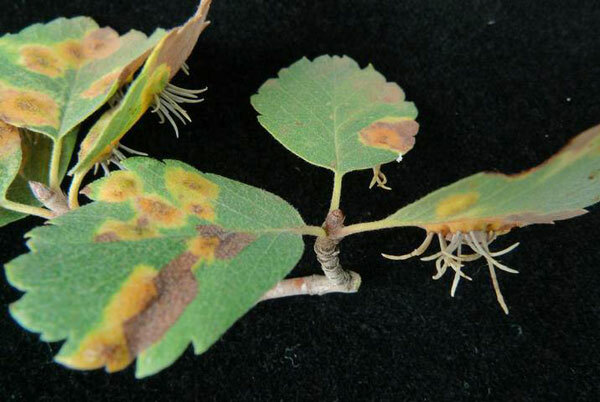 Disease affects serviceberry, apple and crabapple, hawthorn and mountain ash. Leaf spots are small, yellow, slightly raised and may have a red border. Raised, gummy, yellow droplets form in the center of leaf spots and eventually turn into raised, black dots. In highly susceptible hosts, leaf tissue around the leaf spot dies. The spot then turns brown (with a red border) and expands from the infection point to the leaf edges in a wedge shape. Infected leaf veins cause the leaf to curl and become distorted. Small yellow spots with red borders are found on green stems, leaf petioles (leafstalks) and leaf veins. Finger-like tubes develop on leaf petioles (leafstalks), stems and occasionally develop on upper and lower sides of leaf veins. 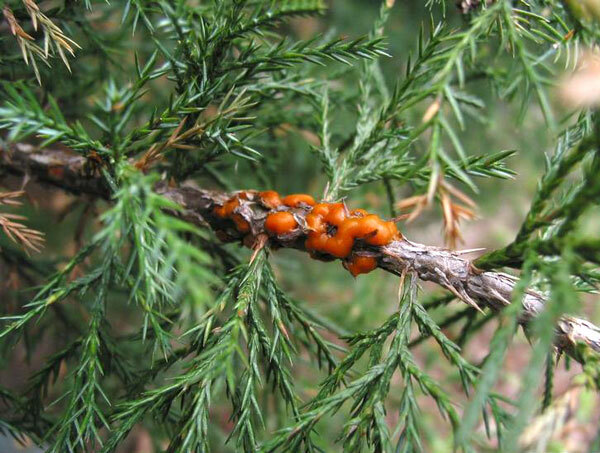 Disease is most common on Eastern red cedar (Juniperus virginiana) and Rocky Mountain juniper (J. scopulorum). It occurs occasionally on Chinese juniper (J. chinensis), creeping juniper and low juniper (J. communis var. depressa). In fall, round, greenish-brown, woody galls up to 2 inches in diameter can be found on twigs and small branches. In wet spring weather, these galls produce orange, gummy, tentacle-like projections that are 1/2 to 3/4 inch long. When dry, the gummy orange structures shrivel to a dry, reddish-brown. Galls can dry and rehydrate several times in one spring. 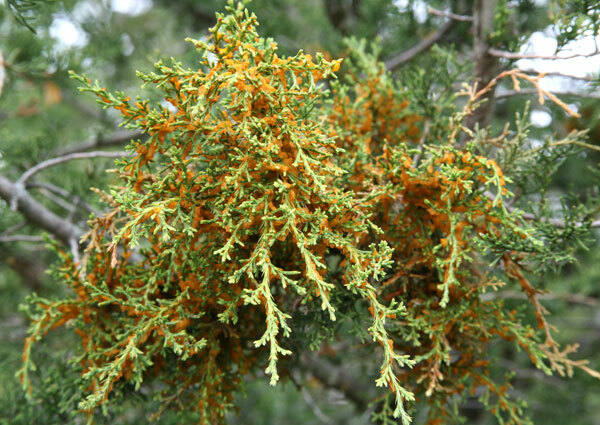 Disease is most common on Eastern red cedar (J. virginiana) and Rocky Mountain juniper (J. scopulorum). It occurs occasionally on Chinese Juniper (J. chinesis), creeping juniper (J. horizontalis), low juniper (J. communis var. depressa) and Savin juniper (J. sabina). Small, reddish-brown, woody galls form along needles and stems. These galls can be round or irregularly shaped and from 1/10th inch to just over 1/2 inch in size (smaller than cedar-apple rust galls). In spring, bright orange, gummy horns form. These horns have straight, blunt fingers that are shorter and fatter than cedar-apple rust galls. Disease occurs on Eastern red cedar (J. virginiana), common juniper (J. communis), creeping juniper (J. horizontalis), Rocky Mountain juniper (J. scopulorum), and Savin juniper (J. sabina). Branches and twigs swell from infection. Later, these infected areas become elongated and their bark begins to peel. In spring, small, orange, gummy blobs come out of swollen areas and cracks along infected branches. Disease occurs on creeping juniper (J. horizontalis), Eastern red cedar (J. virginiana), and Rocky Mountain juniper (J. scopulorum). Round clumps of foliage can be seen any place in the tree canopy. These clumps are clusters of many small branches called witches’ brooms. Swollen, elongated areas with rough, cracked bark can be seen on infected branches without witches' brooms. 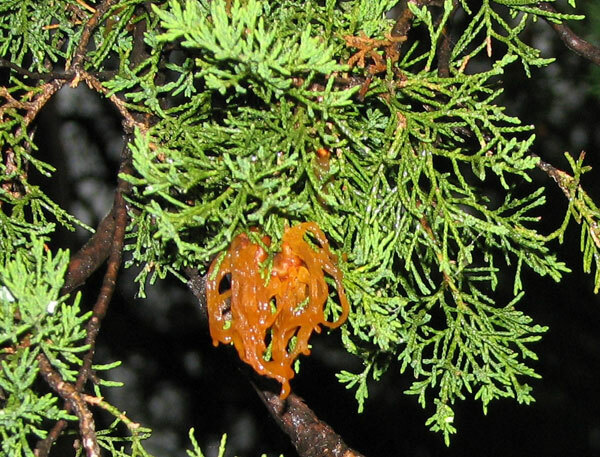 Orange jelly forms on needles and from cracks in infected bark during wet spring weather. Brooms usually die when small but a few survive and may reach 20 to 24 inches in diameter. Japanese apple rust is caused by Gymnosporangium yamadae, a fungus native to Asia. While this disease has been found in the Eastern U.S., it has not been identified in Minnesota. 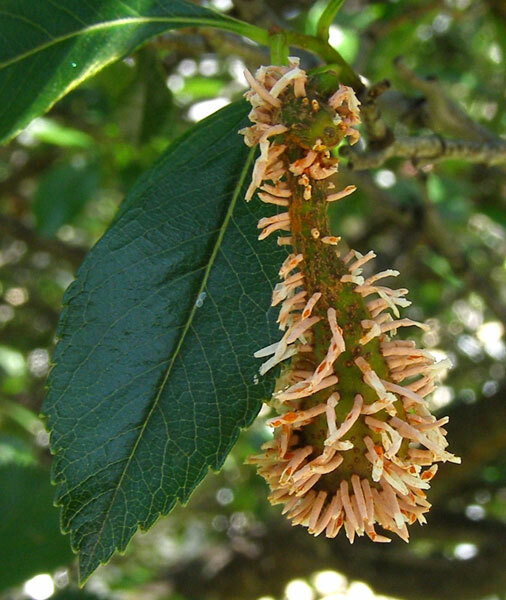 Like other Gymnosporangium rusts, this exotic disease spends part of its life on apples or crabapples and the other part on Chinese (J. chinensis) and flaky juniper (J. squamata). Produces round, woody galls on the branches of Juniper (similar to cedar-apple rust). In spring, these galls produce orange, gummy projections. These projections stick out like rubbery shelves but do not dangle like the horns on Cedar-apple rust galls. On apple trees, leaf spots are bright red with a pale cream to white center. Infection on apple fruit is rare. Long, finger-like fungal spore producing structures come out of the underside of leaf spots in mid to late summer. These structures produce and release chestnut-brown, powdery spores. 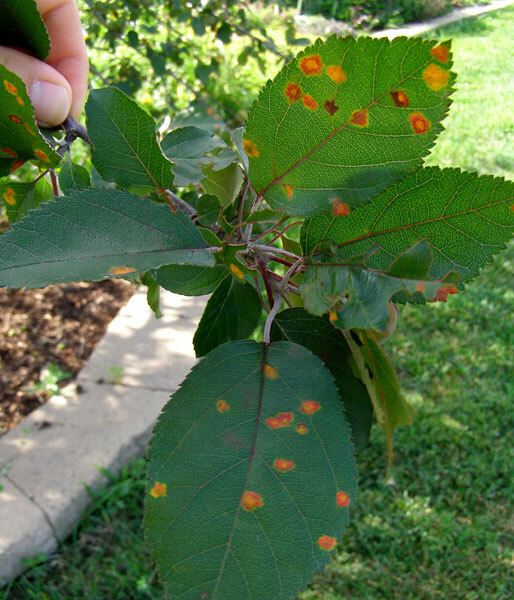 Suspected cases of Japanese apple rust should be reported to the Minnesota Department of Agriculture's "Arrest the Pest" at 1-888-545-6684 or arrest.the.pest@state.mn.us. For more information on controlling diseases of apple and edible crabapple, see Growing apples in the home garden. Plant disease-resistant varieties of crabapple and apple when possible. Rust resistant cultivars of hawthorn are difficult to find. 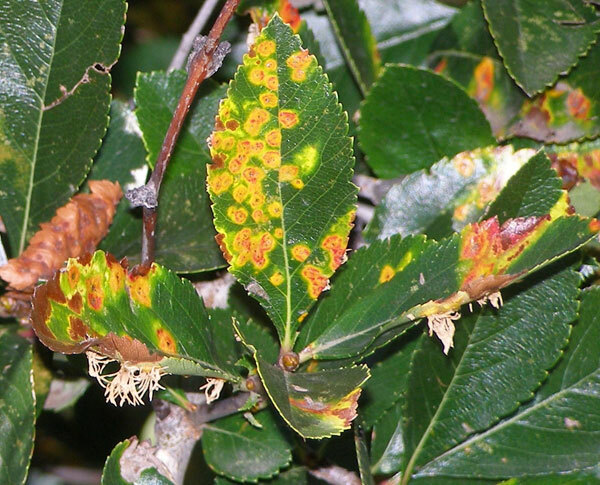 Often a cultivated variety will have resistance to one of the Gymnosporangium rusts (cedar-apple rust) and be highly susceptible to a different Gymnosporangium rust (hawthorn rust). Prune and remove brown woody galls found on eastern red cedar and juniper plants before orange gelatinous spore producing structures form in spring to reduce the level of infection on nearby Rosaceae plants. If applied before infection occurs, protective fungicides can be used to control the disease on Rosaceae plants. Typically, this occurs when flower buds first emerge and continues until spring weather becomes consistently warm and dry. 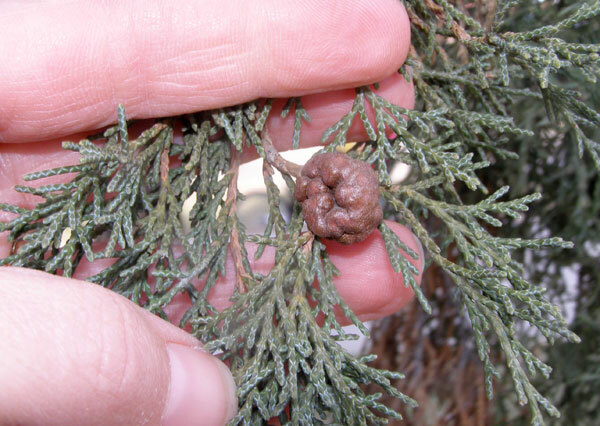 Nearby infected junipers can be monitored and fungicides applied when gelatinous orange spore producing structures appear on galls and branches. Plus sign (+) if content is closed, 'X' if content is open. 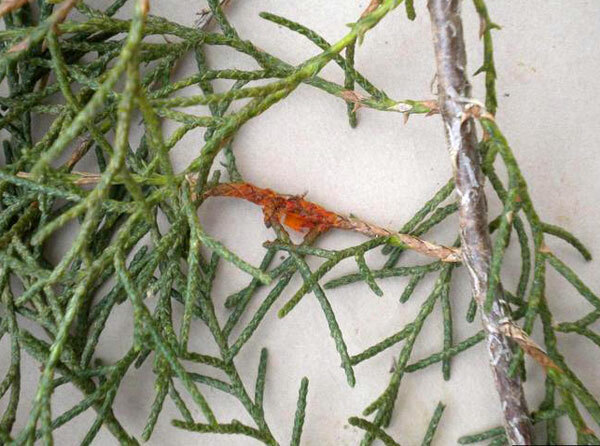 On Juniperus spp. Galls and witches' brooms on eastern red cedar or junipers do little harm to the tree or shrub and do not need to be managed. Galls and witches' brooms can be pruned off to improve the ornamental value of the tree or shrub. Quince rust cankers should be pruned out of the tree or shrub. The pruning cut should be made several inches below visible signs of the canker to insure complete removal of the fungus from the tree or shrub. Some resistant varieties of Juniperus are available and should be used in areas where Gymnosporangium rusts are a known problem. Fungicides are not recommended to protect eastern red cedar or junipers from infection. Some resistant varieties of <em>Juniperus</em> are available and should be used in areas where <em>Gymnosporangium</em> rusts are a known problem. Do not plant alternate hosts of the rust fungi from the rose family near near juniper and cedar hosts. Reference: Table adapted from Diseases of Tree and Shrubs, Sinclair and Lyon, 2005.